Ergonomics is a big interest and please take a look at my Ergonomics page + under-page. 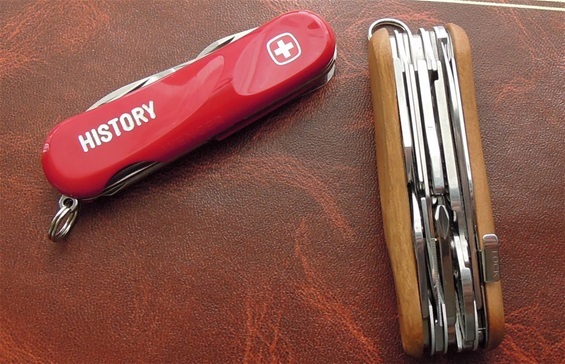 If you study the history of Swiss army Knives then you will discover that the red classic shape knives got its advantages and disadvantages all depending of your philosophy in knives. The Evolution of the functions and mechanisms on a SAK show changes and development in History. There is also much evolution with the use of Swiss Symbols on the handles. The use of different materials in the handle scale is also special from the beginning until today. The Evolution introduction on the Wenger knives is maybe one of the really big changes on the handles on the knives. It does represent a big milestone. This sad it is important to see just how the evolution handles does perform and why it is made. Ergonomics is important!